In the earlier release 13MM of Si Stebbins , with one single effort you could get triple payoff. Here, your one single effort gives you 6 times the payoff. The rules are so easy that a school kid could learn this in no time at all. Imagine the power of having 6 memorized decks at your finger tips. That too by knowing just one set of simple and easy principles, which almost become intuitive when you get familiar with them. Hello unknown mentalist, please stop releasing stuff like this. At this rate I will go broke shortly. This is my 4th purchase here and 3 of them are yours. Fantastic ideas, shortcuts and routines. Top class thinking. I acquired a powerful tool. My God, I cannot believe that now I know 8 stacks in and out. Great value for money as well. This is almost revolutionary. 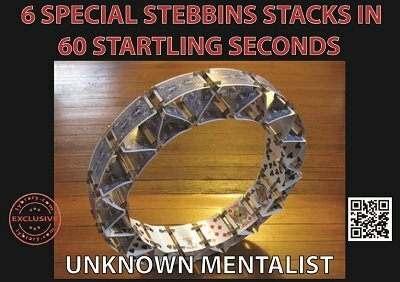 It changes everything about the good old stebbins stack. The age old theory that professionals avoid si stebbins due to its inherent weaknesses, now goes for a big toss. This 8-in-1 discovery is a game changer. I can now intuitively SEE all 8 stacks, yes it is 8 and not just 6. And after seeing this terrific suit system and how it plays for all the stacks, you will never go back to the red/black pattern of chased or shocked etc.